We work to reduce the burden of COPD by offering self-management and caregiver education, supporting research efforts to improve care, and by changing policy. 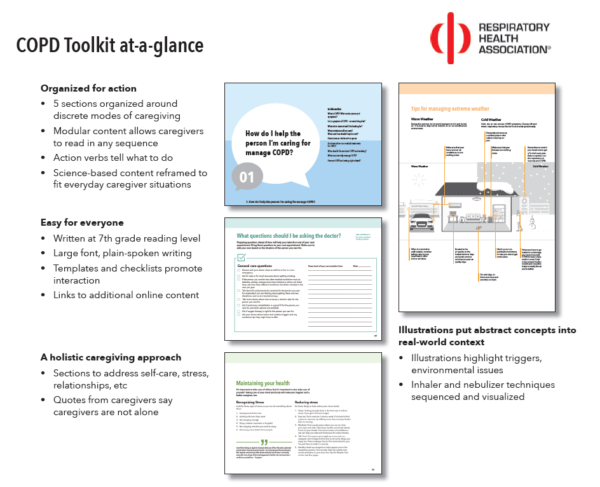 Addressing the needs of families affected by COPD, we developed the COPD Caregiver’s Toolkit, a first-of-its-kind “toolkit” of resource materials for informal caregivers of people living with COPD. RHA is now pilot testing the toolkit with COPD caregivers, COPD patients, and researchers. For more information about the COPD Caregiver’s Toolkit, contact Erica Salem, Senior Director, Strategy, Programs & Policy, via email at [email protected] or by phone at (312) 628-0235. Inspiration is a newsletter written for people with COPD and their caregivers. It contains practical tips for living well, the latest in COPD research, and legislative updates that may affect your life. It is published once per year. RHA’s annual Living Better Together COPD Conference brings together individuals living with COPD, their caregivers, pulmonary rehabilitation staff and medical staff for a one-day learning event. Educational sessions focus on understanding COPD and developing strategies for living better with COPD. The event is held each year in November and offers a keynote address, breakout sessions, and an event exhibit hall. Oxygen therapy is available at no cost and transportation is provided from select sites across Illinois.